London South Bank University (LSBU) has launched the Knowledge Exchange Voucher Scheme, which will provide £4,000 bursaries to postgraduate research students. The vouchers will support students to work with an industry or non-profit organisation on a commercial project that is relevant to their studies. 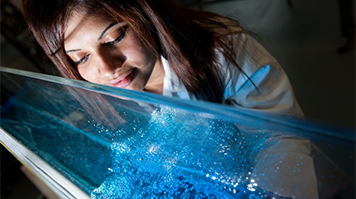 Delivered by LSBU’s Knowledge Exchange Institute, the scheme will encourage students to work towards developing innovations that will benefit the company or organisation, whether by developing applied research, new products, services or processes. By helping organisations grow or boost their performance, students will be making a positive impact on the UK economy. The bursary will cover time and expenses. Students will also utilise the University’s specialist research facilities and academic experts to drive their industry projects forward. “While helping to support students, the Knowledge Exchange Voucher scheme will also enhance their value in regard to future employment and allow them to maximise their potential. At the same time, it will allow LSBU to build relationships with external partners to develop further opportunities for collaboration,” said Neil Pearce, Head of the Knowledge Exchange Institute.